FOR new mum Patrice Albury-Dor, breast milk is a valuable commodity. At home with three-month-old baby boy Eren and husband Andrew, the little family is a picture of baby bliss and the first-time parents couldn't be more content. It's a happy little bubble Ms Albury-Dor wants other new mums and babies to be able to share, and she's using 17 litres of breast milk to help make that happen. 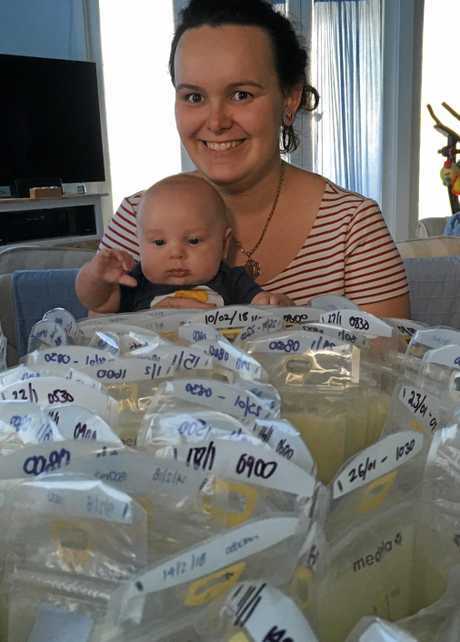 Ms Albury-Dor, from Booval, has collected her breast milk, the part little Eren was too full to eat, and packaged it for donation to the Queensland Milk Bank. The milk bank allows other mums, who are unable to feed their children themselves, the ability to choose between formula and donated breast milk. "It's probably a healthier option for the kids at the hospital to be getting rather than formula. It's specifically made for babies," she said. "When babies are premature, sometimes mothers have a lot of trouble producing milk because their babies aren't suckling, they're too small. Their breasts don't produce enough milk so they need extra." Eren's early life hasn't always been milky bliss. He spent a night in intensive care at Lady Cilento Children's Hospital when he was just a few days old. Ms Albury-Dor, an emergency nurse, was on the receiving end of the emergency treatment she had spent years providing. Eren was born four weeks early and the new family was facing the prospect of having to rely on other mums for breast milk. With the help of expert care and a little liquid gold, Eren was able to thrive and is a happy, bubbly baby. "The birth happened so quickly we didn't have enough time to think about if I could breastfeed him. We did have some trouble initially because he was so small," Ms Albury-Dor said. "He went to ICU at Lady Cilento and we both worked really hard to get a good supply. Anytime Eren needed to be settled I would feed him rather than rock him or give him the dummy and that built up my supply quite well. It's the only thing that went right. We had to do IVF to conceive him, my pregnancy was pretty terrible. I got sick at the end, then I had to have a caesarean and then Eren was sick as well. "Everything was going wrong except for the breastfeeding and that's the reason why he has gotten so big. I would definitely consider using donor breast milk rather than formula if I couldn't feed him." Today, baby Eren has a lot to owe to his mum's milk. "He's pretty happy all the time, eats a lot, poops a lot and loves a cuddle," Ms Albury-Dor said. "He just started gaining weight so quickly. He was active and happy all the time. It was amazing. It comes down to being able to feed him well. "Because Eren was sick in the beginning we wanted to make sure he had the best opportunity to fight any infections and to grow and get big. As far as I'm concerned that's the best way to do it and it worked for Eren." A LITTLE bit of milk can make a big difference to sick babies and their mums. New mum Patrice Albury-Dor knows only too well the value of breast milk and she's making sure other mums can share its goodness by donating her excess supply to the Queensland Milk Bank. Ms Albury-Dor and the Queensland Milk Bank are encouraging other mums to think about their options for donating breast milk, because it could help save a baby's life. "It's such a waste if you produce more to try and reduce your production," she said. "It's something that is precious. It's a sought-after commodity like blood or organs. It's something that babies need. I want to make the most of the opportunity. "It's such a precious gift to be able to give to another mother, to be able to provide nutrients and cover from infections so they don't end up even sicker than they are. 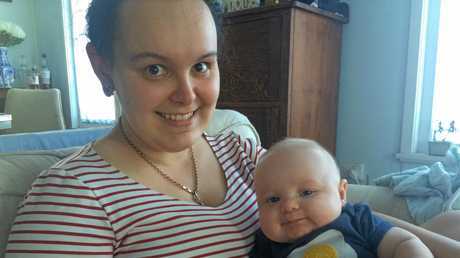 "If you can provide that little bit of cover for little babies, before they can get their immunisations and develop their immune system, it's so worth it. "It will make you feel good and help little babies. Formula is a great alternative but science just hasn't caught up yet." Ms Albury-Dor said to be able to breastfeed her baby was one of the most important transitions to motherhood for her and baby Eren. "The main reason that I wanted to donate is that I know what it feels like for your baby to be sick and the stress that comes along with that. I can't imagine how hard it would be to have a little baby that you just want to give the best chance at life by providing all the antibodies and immune boosters that you get from breastmilk, and not being able to get that supply," Ms Albury-Dor said. "It's as much of a gift to the mothers as it is to the babies. Knowing that your baby has just that little bit more protection from illnesses while they're young and vulnerable is really important for peace of mind." For more information visit Queensland Milk Bank.